← Combining inclusion and protection? Financial inclusion – even though it sometimes feels like a Sisyphus job…. 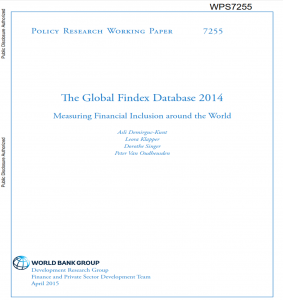 However, I must say I felt happy after reading the recently published Global Findex Database 2014. The document presents the current state of financial inclusion and even though we are still missing 2bn people currently unbanked (of which 1.1bn are women), we still were able to provide 700m people with bank or mobile money accounts between 2011 and 2014. So how did this happen? 62% of adults worldwide have an account at a bank (up from 51% in 2011), at another financial Institution, or a mobile money provider. And this is exactly the point: in 2011 “accounts” had been defined in a different way, ie., accounts had been bank avcounts at a formal financial institution, whereas in 2014, “accounts” also include mobile money wallets. Between 2011 and 2014, 700m adults became account holders, i.e., the number of the unbanked dropped by 20% to now 2bn people. This growth is primarily the result of an increasing account penetration of 13% in developing economies and innovations in technology—particularly mobile money, helping to rapidly expand access to financial services in Sub-Saharan Africa. Again the main reason being a different definition of the term “account” between 2011 and 2014. The blog of the European Microfinance Platform has explained this as well. 69% in East Asia and the Pacific. Thirty-eight % of adults remain unbanked. Yet among the survey respondents without an account, only 4% said that the only reason for not having one is that they do not need one. By providing a regulatory framework conducive to expanding account ownership—such as licensing bank agents, introducing tiered documentation requirements, requiring banks to provide basic or low-fee accounts, and allowing the evolution of new technologies such as mobile money—policy makers can lower or even remove barriers to financial inclusion. 17 percent (105m) in South Asia. Encouraging those who send or receive domestic remittances only in cash or through over-the-counter transactions to do so through an account. In developing economies 14% of unbanked adult (270m of those without an account) send or receive domestic remittances only in cash, while 5% of unbanked adults (100m)—do so only through over-the-counter transactions. This suggests an enormous opportunity for designing appropriate, affordable, and convenient financial products to enable unbanked adults to send or receive domestic remittances through an account. This opportunity is especially large in Sub-Saharan Africa, where 22% of unbanked adults (80m people) send or receive domestic remittances only in cash, and 12% unbanked adult (40m) do so only through over-the-counter transactions. Three-quarters of account holders already use their account to save, to make at least three withdrawals a month, or to make or receive electronic payments. Among bank regulators in 143 jurisdictions, a recent survey found, 67% have a mandate to promote financial inclusion. International organizations, including the G-20 and the World Bank, are also beginning to formulate strategies to promote financial inclusion. In recent years more than 50 countries have set formal targets and ambitious goals for financial inclusion. While only 2 percent of adults worldwide have a mobile money account, in Sub-Saharan Africa 12 percent do—half of them a mobile money account only. All 13 countries around the world where the share of adults with a mobile money account is 10 percent or more are in Sub-Saharan Africa. As we have also seen in the GSMA State of the industry report, in 5 of these 13 countries—Côte d’Ivoire, Somalia, Tanzania, Uganda, and Zimbabwe—more adults reported having a mobile money account than an account at a financial Institution. Particularly women and poorer adults, still do not have an account. Among adults in the poorest 40% of households within individual developing economies, the share without an account fell by 17% points on average between 2011 and 2014—yet more than half (54%) remain unbanked. Among adults in the richest 60% of households, by contrast, 40% are unbanked. and the gender gap in account ownership is not narrowing. In 2011,47 % of women had an account, while 54% of men did. Today 58% of women have an account, and 65% of men do. This reflects a persistent gender gap of 7% points globally. In developing economies the gender gap remains a steady 9% Points. The Global Findex data also document how and why people save. Globally in 2014, 56 % of adults reported having saved or set aside money in the past 12 months. 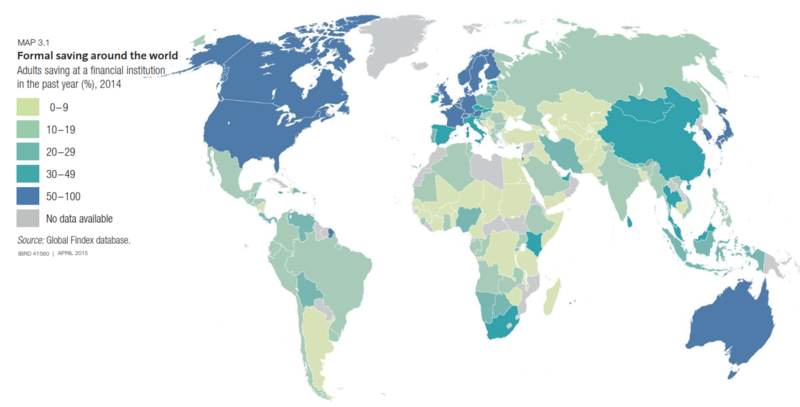 Adults in high-income OECD economies and East Asia and the Pacific were the most likely to have done so, with 71 percent reporting that they had saved, followed by those in Sub Saharan Africa (60%). In other regions between 30% and 40% of adults reported having saved in the past 12 months. A quarter of adults—or almost half of savers—reported having saved formally, at a bank or another type of financial institution. Among savers, the share who reported saving formally was more than 70 percent in high-income OECD economies but only about 40%in developing economies. Compared with 2011, the share of adults saving formally increased in all regions. In high-income OECD economies this share grew by 7% to 52%, while in developing economies it rose by 4% to 22%. In developing economies a common alternative to saving at a financial institution is to save semiformally, by using an informal savings club or a person outside the family. About 9% of adults—or 17%of savers—in developing economies reported having saved in this way in the past 12 months.The 2014 Global Findex survey asked about three specific reasons for saving—for old age, for education expenses, and to start, operate, or expand a business. Worldwide, almost 25% of adults reported having saved in the past year for old age, a similar share for education expenses, and 14 percent for a business. 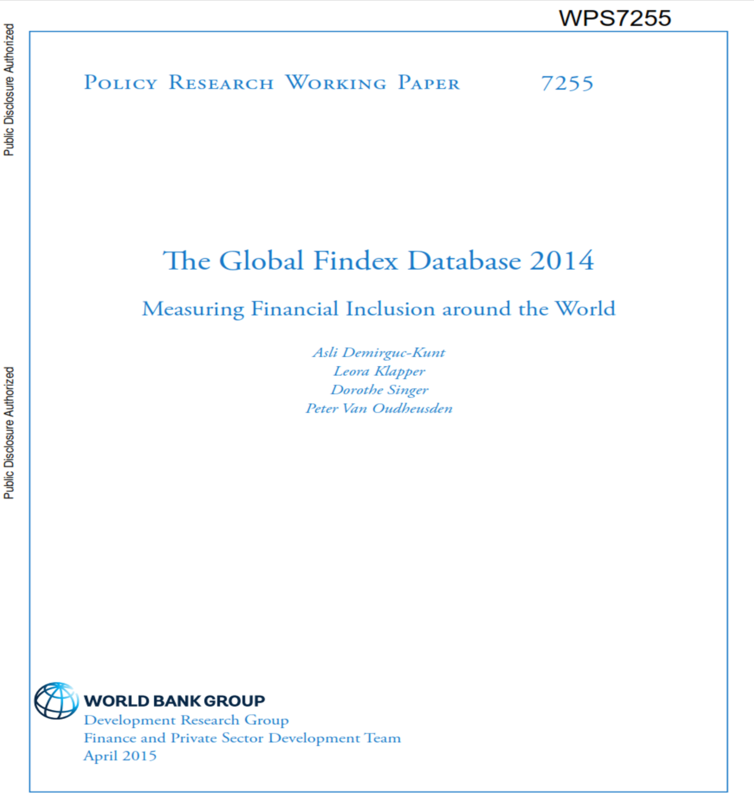 The 2014 Global Findex survey, for the first time, also explored the topic of financial resilience. When people have a safe place to save money as well as access to credit when needed, they are better able to manage risk. 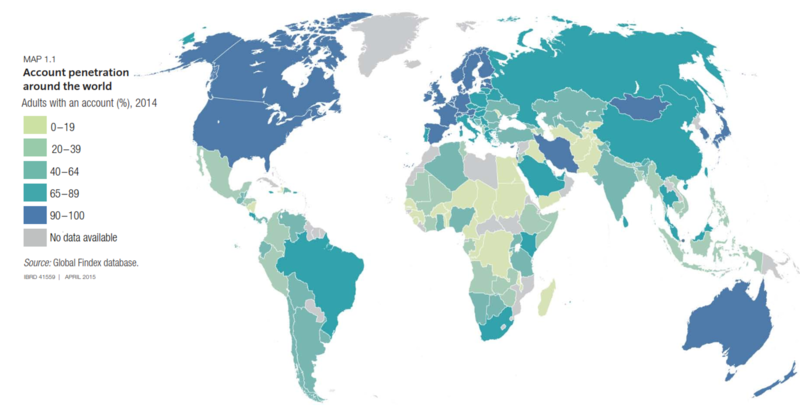 To better understand how financially resilient adults around the world are to unexpected expenses, the survey asked respondents how possible it would be within the next month to come up with emergency funds equal to 1/20 of gross national income (GNI) per capita in local currency—$2,600 in the United States. It also asked what the main source of funds would be. Globally, 76% of adults reported that it would be possible to come up with that amount. Within this group, three-quarters said that either savings or family and friends would be their main source. In developing economies 28% of adults able to come up with funds cited savings as their main source—yet 56% of those who said that they would rely on savings do not save at a financial institution. This suggests a large opportunity to design appropriate formal savings products to keep savings safe and accessible in the case of an emergency. 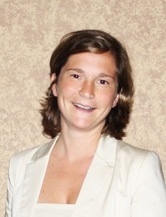 This entry was posted in Allgemein and tagged access to finance, research. Bookmark the permalink.